Xinshu Grace Xiao is the new Director of the Bioinformatics Interdepartmental Ph.D. Program, appointed by the Deans of Life Science and the School of Medicine. Grace has an impressive record combining computational and experimental approaches to study fundamental problems in RNA processing and regulation. Her long-standing commitment to the Bioinformatics IDP and her interdisciplinary training and research make her an exceptional choice to lead the program. Grace received her undergraduate degree from Tsinghua University, an M.S. in Mechanical Engineering from M.I.T. and a Ph.D. from the Division of Health Sciences Technology at M.I.T. Following postdoctoral research in the Department of Biology at M.I.T., she joined the Department of Integrative Biology and Physiology here at UCLA where she is now a full professor. She has been an integral member of the Bioinformatics IDP, serving on the Executive Steering Committee, the Curriculum Committee, and as a member and Chair of the Student Advising Committee. Grace takes over leadership of a program that has grown to become a major Bioscience Ph.D. program at UCLA, nationally recognized for integrated training in big data at the interface of computer science, mathematics, statistics, biology, and biomedicine. Under the prior Directors, Chris Lee and Yi Xing, the program has become a pillar of the vibrant and growing data science community at UCLA. Grace brings interdisciplinary experience and vision to build on this foundation and advance the Bioinformatics IDP as a premiere training program. On April 12, 2018, Johnson & Johnson named the six winners of their Women in STEM²D Scholars Award. This award “supports women at significant points in their research careers in the disciplines of Science, Technology, Engineering, Math, Manufacturing and Design (STEM²D)”. UCLA Bioinformatics IDP Faculty Member, Jingyi Jessica Li was announced as the winner in the field of Math. We are very proud to have her as part of the Bioinformatics IDP faculty and congratulate her on this accomplishment. 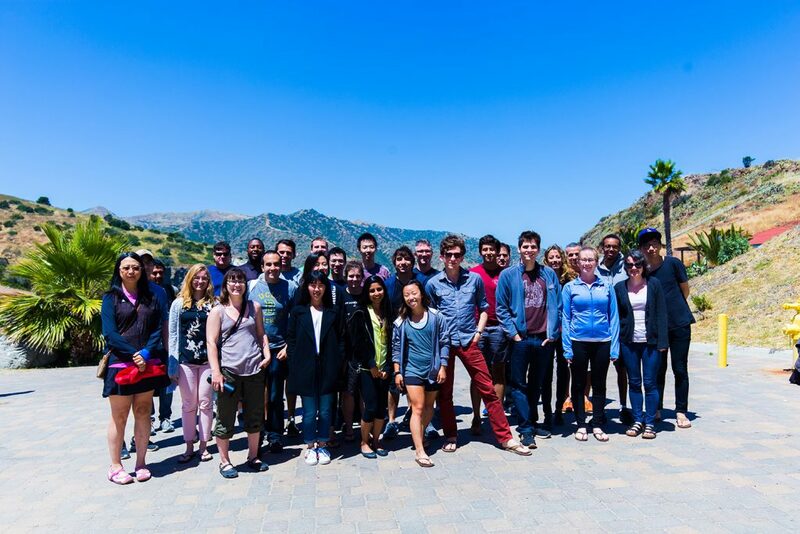 This year, Bioinformatics IDP PhD students Kikuye Koyano and Artur Jaroszewicz organized the retreat at the University of Southern California’s Wrigley Marine Science Center in Two Harbors, 20 miles offshore from Los Angeles. During the 3-day retreat, Bioinformatics IDP graduate students presented research papers and held forums on applying for fellowships, writing letters of intent, managing graduate school funding packages, and using campus mental health resources. In addition to science, faculty and students enjoyed hiking the chaparral hills, kayaking in the bay, snorkeling in the kelp forest, and enjoying dinner overlooking the beach in Two Harbors. UCLA Bioinformatics faculty member Xia Yang’s research on brain trauma was featured on the UCLA Newsroom website. UCLA Bioinformatics faculty member Sriram Sankaraman was among 126 scientists and scholars in the United States and Canada selected to receive 2017 Sloan Research Fellowship. The fellowships are awarded by the Alfred P. Sloan Foundation to early-career scientists and scholars who are the “rising stars of the academic community” and who are “transforming their fields and opening up entirely new research horizons,” said Paul Joskow, president of the Sloan Foundation. Congratulations Dr. Sankararaman! UCLA Bioinformatics faculty member Grace Xiao was recently awarded a prestigious grant from the National Human Genome Research Institute to expand the ENCyclopedia Of DNA Elements (ENCODE). Congratulations Dr. Xiao! Congratulations to Favour Esedebe, mentored by Dr. Roel Ophoff, and Kofi Amoah, mentored by Dr. Tracy Johnson, for winning prestigious poster awards at this years ABRCMS meeting in Tampa, Florida. The Annual Bimedical Research Conference for Minority Students (ABRMCS) had over 4,000 attendees, and 1,500 student presentations this year. For his paper, “Leveraging functional annotation data in trans-ethinic fine-mapping studies”, current Bioinformatics Ph.D. student Gleb Kichaev was chosen as a recipient of the Cotterman Award at the 2016 American Society of Human Genetics (ASHG) Annual Meeting, held October 18-22 in Vancouver, Canada. Each September, the editorial board of The American Journal of Human Genetics selects two articles published in the journal in the previous year that best represent outstanding scientific contributions to the field of human genetics. Two Cotterman Awards are given annually, with a monetary award of $1,000 and a plaque being presented to the recipients. These top two papers must be published in the Journal during the previous year on which the first author was either a pre- or post- doctoral trainee and an ASHG member. UCLA Bioinformatics faculty member David Eisenberg’s research on disease-carrying mosquitoes was featured on the UCLA Newsroom website.